Living his best life. Former president Barack Obama resurfaced in Washington, D.C., on Sunday, March 5, looking very relaxed after President Donald Trump made unsubstantiated claims that Obama wiretapped Trump Tower during the election. The 44th POTUS, 55, and former first lady Michelle Obama, 53, were photographed exiting the National Gallery of Art with a Secret Service bodyguard in tow. 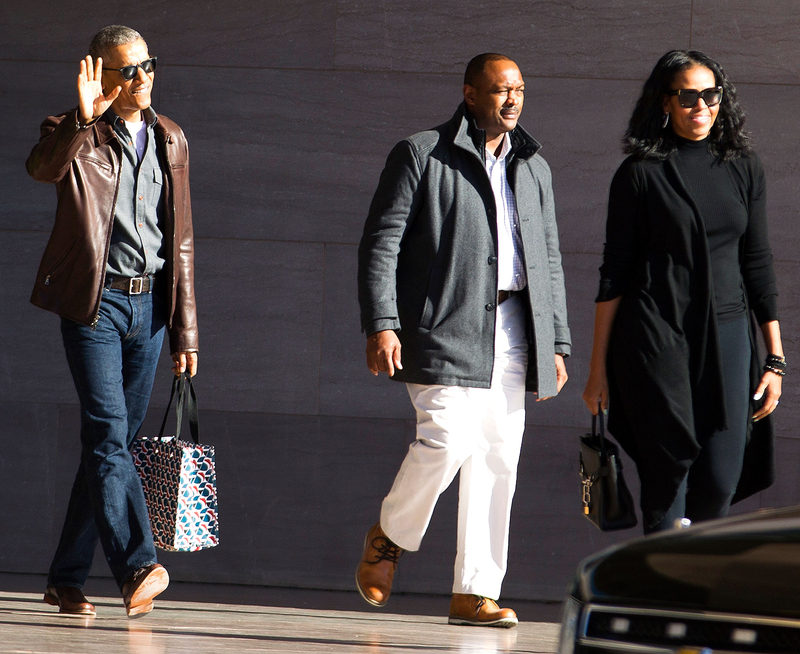 Barack showcased his off-duty style in a brown leather jacket, jeans and sunglasses, while Michelle kept casual in an all-black outfit. Both carried shopping bags and smiled at the crowd. Just a day earlier, Trump, 70, accused his predecessor of ordering surveillance at his NYC home and office space while he was campaigning. “Terrible! Just found out that Obama had my ‘wires tapped’ in Trump Tower just before my victory. Nothing found. This is McCarthyism!” he tweeted on Saturday, March 4, referring to Senator Joseph McCarthy’s reckless attacks on political adversaries in the late ’40s and early ’50s. Trump added in a series of tweets, “I’d bet a good lawyer could make a great case out of the fact that President Obama was tapping my phones in October, just prior to Election! How low has President Obama gone to tapp my phones during the very sacred election process. This is Nixon/Watergate. Bad (or sick) guy!” It appears the ex-Apprentice host got the information from a report by the ultraconservative website Breitbart, which included no proof. After the allegations, the White House called for Congress to officially investigate Trump’s claims. However, Obama’s former Director of National Intelligence, James Clapper, has already denied the accusations.